Chef Marjorie Ohrnstein has been working as a chef, food stylist and culinary educator for 25 years and has won over 40 culinary awards from major food companies. 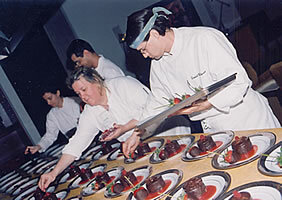 She has worked as a private chef and caterer for people like Arlene Sorkin, Christopher Lloyd and Pat O’Brien and has had the pleasure of serving celebrities like Robert de Niro, Sylvester Stallone, Whoopi Goldberg and William Jefferson Clinton – click here to see who else has enjoyed Chef Ohrnstein’s cooking! Her teaching credits include classes at Two Plates Full and What’s Cooking in Scottsdale, Arizona, and Ojai Cooking School, Sur La Table and Williams-Sonoma in Los Angeles. She has studied at Le Cordon Bleu in London and Paris and the Four Seasons Cooking School in New York. Gee Baker is the head bartending manager for Fun Food Catering. He has been a professional bartender for 20 years and graduated from Your Host of Hollywood Bartending School. He will work with Chef Ohrnstein to assure that your bar is well-stocked and serviced, and if you just need a bartender, Gee is available for all your bar needs. Contact him through Fun Food. When you hire Fun Food Catering, a staff of professional servers, bartenders, chefs and prep cooks will work under Chef Ohrnstein to assure that your party runs smoothly and looks as beautiful as it tastes! 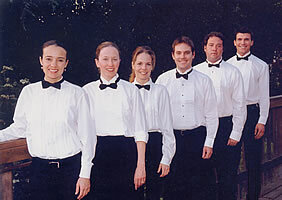 Together, the staff has over 50 years of experience – just sit back and relax, while they take care of everything.